In the heart of James Cook University in Townsville, lies the new Verandah Walk – a pedestrian and cyclist link that weaves through the regional campus. Wilson Architects has completed stage one of the project, the Verandah Walk South Node, which connects Education Central and the Eddie Koiki Mabo Library across Waada Mooli Creek. The design creates a series of ‘nodal’ meeting and seating areas that encourage students to study, collaborate and socialise in an open-air landscaped setting. The Verandah Walk enhances the student experience and creates a sense of quality and permanence, previously lacking on the site. The architects’ challenge was to design a 420m long covered walkway that sits well on its site, without overwhelming visitors with its scale and length. The deliberately-curved walkway directs attention outwards to the landscape, rather than focusing the user's view 'down the barrel' of a long straight path. The curved path provides the required wayfinding cues while creating an experience of ‘journey’, instead of ‘destination’. 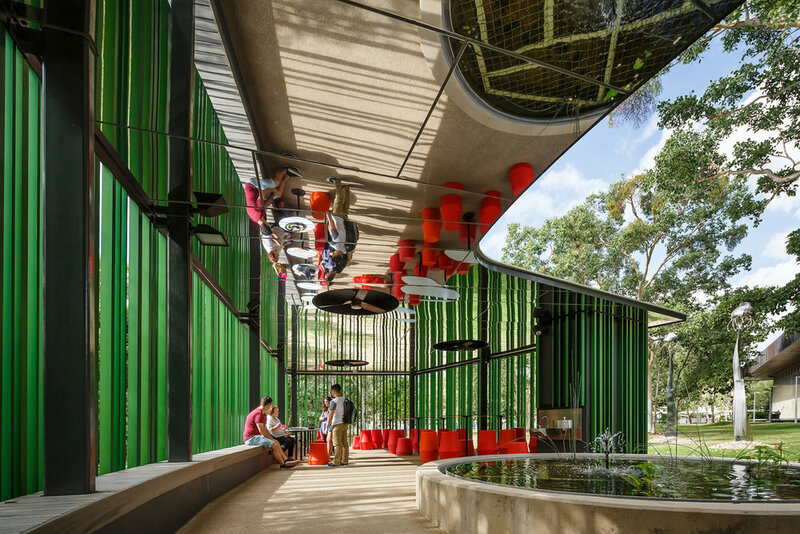 This project embraces and responds to the unique tropical narrative of the region, by considering light, shade, humidity, breeze, scent, water/rain and colour. Increased access to daylight and fresh air circulation supports improved levels of concentration, cognitive function and mental well-being for students, staff and visitors. Polished aluminium lines sections of the soffit, and works to reflect the landscape back out to passers-by. Four pavilions extend out from the path and operate as connected outdoor learning spaces, with power and Wi-Fi throughout. Nearby fountains provide further respite from the hot climate, by creating a cooling effect and atmospheric background noise.